After the eclipse of 21st August, ‘life’ as we ‘knew’ changed/altered very much. Many are feeling this personally and one can/may feel this around the world as well in a general new ‘current’ of energy that may not be so visible, yet it is here. Remember, all that is coming up and out is part of this transition of the pre-dawn dawning energies. ‘Ascension cannot be rushed, fooled or cheated’ and greater changes on the planet WILL TAKE TIME…and it STARTS WITH US FROM WITHIN…and then all else flows and filters outwards. Also, please remember this is not instantaneous tadaa as in ‘The New Earth is here people, all you ever wanted is instant’. For those who are wondering or wanting to know more what I mean by this, in Pts 1-5 I shared what I saw or was shown to me of where we are currently ‘at’ with the Dawning (pre-dawn) of our New Earth, as this came through, as we shifted into this NEW EARTH energy space, as we are still in a transition of this. This is why I am so very excited as I have seen it and felt it within myself (and many others are/have as well). And it is the first time I have shared what I see in 6D embodiment, as this not been done/shared before! We are still needing to continue to come from our hearts and link our Soul to our Spirit and all else we are needing to experience to help bring through within and through ourselves our New Earth. Yes it is finally here, yet, what remains is our continual ‘coming home to ourselves’ and our Souls Divine Journeys. To continue to bring the Divine ‘in’ and ‘with’ us in all we do! Asking – ‘help me to help myself’. As we are coming home to our ‘SOVEREIGNTY”. So, currently we are now in a New Transition due to being (of what I call) a Pre-Dawn Dawning of a New Earth energy. Bush Iris has come up at this time to help us with this, which one can read the following and feel this whilst tapping the Crown Chakra and feeling the flow coming through like water droplets. Reading and feeling and bringing through the positive aspects of this essence. ‘It is an Essence to open people up to their spirituality and to access the doorway to their higher perceptions. It allows the trinity to flow into a person and is an excellent remedy to give someone who has just started meditation or ‘conscious’ spiritual growth. In the negative mode there will be materialism and/or atheism. There may also be a deep seated fear of death. Trinity energies is what is coming through in the human linked to Spirit. Read that again…not only is this triple, this is triple within triple in situations. Triple the macro then the micro within is x 3! No wonder so many of us are so exhausted right now! ‘I needed to do an errand and then I felt strongly to go home and could do it tomorrow…then I paused and felt into it as something felt different – I felt confusion – and then it came that I would just have to come back – and then I felt a ‘resistance energy’ and then I pushed through it – then all of a sudden I went and did the errand and it was like I stepped out of a bubble of old energy into NEW energy! Or out of TWO energies and INTO ONE! 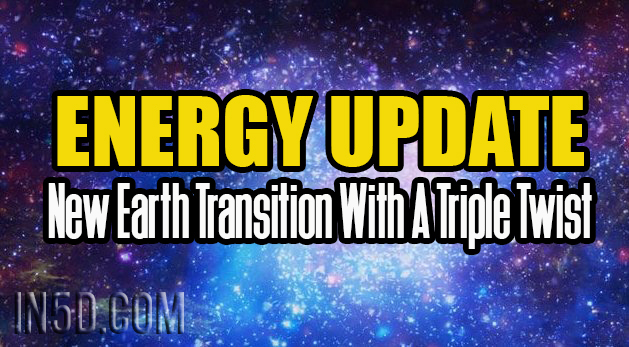 This happened with 3 more instances, in other areas – I knew with the 2nd time that this was the new energies and a new process for where we are at right now with the eclipse energies and it is linked to the drawing/vision I saw of what was happening in the astrals/multi-dimensions. This was a basic example but the same was applied in a situation in someone who felt strongly to move overseas….they felt very strongly to go, yet felt the confusion with this, then they sat with this and then were clearly guided to not go and to push through the old timelines to do with this and to stand up for their reasons and say NO = New Dawn. Then last night for myself, a previous routine in something I have done for years re-presented itself and I did this and then I felt into this as there was that confusion energy or energy of something not ‘sitting with me’ and I said NO I am not going to do this in this way anymore and pushed through the old and it shifted = New Dawn’. And now, in such a brief amount of time, this has now been extended/added to with also~ Triple ‘areas’ we are faced/dealing with – energetically. It is a blend of not only facing two possibilities of examples as shared, but also adding the Triple or Trinity energy with this as well!! Are you still following me here lol. As that is quite a lot to ‘take in’. We are in a Pre-Dawn of this New Dawn of a New Earth and it will take time as there is more to do, as we have adjustments and new templates we are creating and so much more, as shared in examples above. This IS HERE and I am very excited as life is no longer the same. Much Divine Love and Blessings – always.